Kristine Kathryn Rusch has been writing under various names in multiple genres gaining accolades wherever she has ventured. Rusch was also an editor for The Magazine of Fantasy and Science Fiction for a number of years winning a Hugo for her work there. Diving Into the Wreck is my first try of her work, but will surely be only the start to many others. Diving Into the Wreck is like something out of the Golden Age of Sci-Fi as it feels like a timeless tale in the far future, which is an amazing irresistible and speedy read. The book is broken into 3 interlocking stories that would have acted well on their own in novella form, but together form a rich universe and history. It is a very personal book that ends up being quite a bit more than you expect. The stories get bigger and bigger with the telling until you reach a somewhat intense culmination. Diving is very reminiscent of Pohl's Gateway or possible placed in something close to the Babylon 5 universe. The stories are told from Boss's view in an almost journal like fashion. She is not some hero archetype, but a loner who only has human interactions when she deems it necessarily and operates everything she does in a business-like fashion. At first this can make her seem cold, but she has a lot more layers that come through. Boss makes her living traveling through space looking for wrecked space ships, which she hopes can be plundered for treasure, sold, salvaged, or possibly toured with inexperienced divers out for a thrill. Think of her job as an expert scuba diver, but only in space and with a lot more risk. Diving Into the Wreck is easy on the science for those who don't like amazing long scientific explanations to go along with the story. But Rusch's science is well enough explained to suit the story's purpose. It is her universe's history and character building that you'll be drawn to. The crux of the story surrounds Boss's discovery of mysterious ancient vessel that may have lost technology that could change everything in her sector of the universe. She mounts an expedition of sorts into the vessel with a trusted group of divers and odd things happen. From there we also encounter an eerie space station where people have been disappearing for years. Perfectly paced and immensely readable Diving Into the Wreck will satisfy even the most jaded of Sci-Fi reader. If I had any complaints it would only be that it was over too soon and left me for wanting more out of Boss and her cadre of divers. I give Diving Into the Wreck 8 out of 10 Hats. I plan on reading more Rusch and have already ordered a copy of The Disappeared, which is book one in The Retrieval Artist Series a Mystery Sci-Fi series. Unfortunately, The Disappeared is out of print, but used copies are easily had. Maybe an omnibus is needed of the first 2 or 3 in the series to indoctrinate new readers as she only recently released the sixth volume in the series. 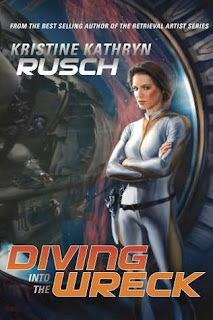 Rusch also mentioned on her blog another Diving Universe book is possible. I sure hope it happens as there is at least one more major mission waiting for Boss.